20th-century dark red morocco, in a red half-morocco drop-box. Purchased on the Fellows Endowment Fund, 2003. De Maubruny family; André Hachette; C. Franklin, Heribert Tenschert (Cat. 16, 1985, no. 27); sale (London, Sotheby's, July 8, 1970, lot 97); sale, (London, Sotheby's, July 3, 1984, lot 87); H.P. Kraus sale (New York, Sotheby's December 4 & 5, 2003, lot 326); purchased on the Fellows Endowment Fund, 2003. 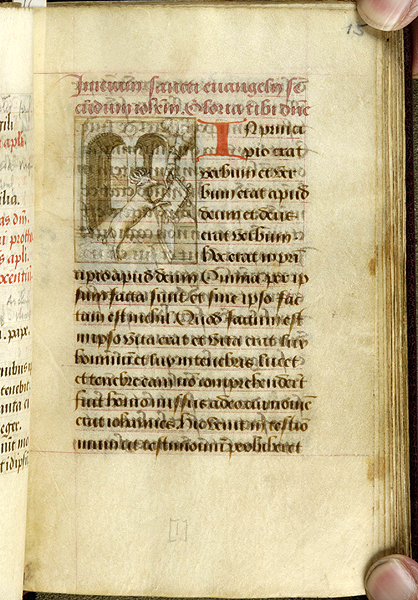 Ms. book of hours for the use of Rome; written and illuminated in Bourges [? ], France, ca. 1522. The calendar, which includes several Breton elements, is preceded by a table of Golden Numbers for the years 1522-1536. Decoration: 12 near full-page grisaille miniatures drawn in sepia, pen and wash, and heightened in white; 7 quarter-page grisaille miniatures drawn in sepia, pen and wash and highlighted in white, four of which are on blue grounds. Artist: Stylistically related to the 1520s Hours Workshop as well as the "Master of the Doheny Hours" and his workshop.